A super quick dessert that is sure to please. I like to make extra of the nut crumble mixture and keep it in the cupboard so that when I need a dessert fix I can easily whip up this delectable dish. You can use other nuts such as almonds, hazelnuts or macadamias if you prefer. 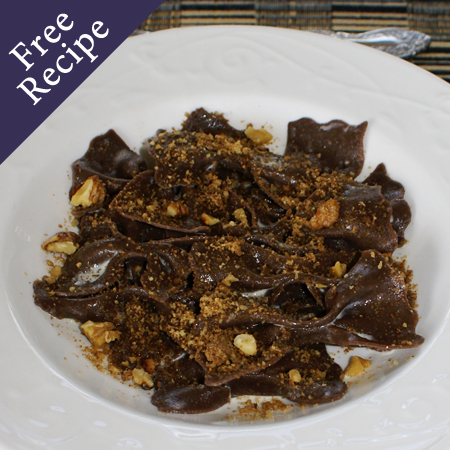 The walnut crumble is also used in the Apple Ravioli recipe see p.108 in Goodness Me it’s Gluten Free PASTA. Place a large pot of heavily salted water on to boil using a high heat. Dry roast the nuts in a hot frying pan, until the walnuts start to brown a little. Set aside a few larger pieces of walnut. In a spice grinder or small blender process the remaining nuts until they are crumbs (not flour). Tip nut crumbs into a small bowl then add in the brown sugar and spices and mix well. Roughly chop the walnuts you had set aside then add to the crumble mix, this adds texture to the dish. When the pasta water is boiling rapidly, add the farfalle, immediately stirring to separate. Boil uncovered until the pasta is al dente (3 – 4 minutes). Warm the cream in a large saucepan then add the drained pasta and mix to coat evenly. Serve the pasta then sprinkle the crumble mix on top. If you would like a chocolatey sauce, add 2 Tablespoons of chocolate spread to the cream and mix until melted through and the cream has turned a beautiful chocolate colour.